It has been about a week since I have been able to see some of my dearest friends and family since moving to Connecticut back in August. There is something particularly sweet to seeing friends you have not seen in a while in contrast to seeing them day to day for years on end. But clearly, there is also something profoundly sad about their absence. As C.S. Lewis once mentioned, friends walk “side by side, [as] their eyes look ahead.” There’s an aspect of friendship which means that I can be away from my dearest friends and know we will never be too distant – that even when we re-meet after many months or years there will often be a sense of connectedness simply off the fact that we are on the same journey. But even so, there is an element of it that feels that even though we stand side by side, we still walk on separate sides of the road. My most intimate friendships, whether explicitly talked about or not, are ones of shared waiting. And during this Advent season, that just seems the proper thing to blog about. I find it ironic that I have begun the final third of the Lord of the Rings (“Return of the King”) during Advent season – especially as I consider these things. The conclusion of “The Two Towers” left me particularly aware of the active waiting of friendship as Frodo and Sam approach Mordor and consider what the storybooks might tell of their grand adventure that, in that moment, seemed ever so far from possible completion. Would they accomplish their task? Would the dark shadows of Middle Earth be finally done away with? Would they even have a home to return to? Waiting brings us together. Whether it is waiting together for the midnight release of Star Wars, waiting for your food to finally arrive at your table as you converse, waiting eagerly for Sauron to finally lose the upper hand, waiting for Christmas morning to open presents with your siblings, or waiting for the day that Jesus would arrive and make all the sad things come untrue, intimate friends share the wait together. And in our case and Frodo’s, without friends who wait with us, seeing the end would be a far harder – if not impossible – journey. So whether you have those sorts of friends or not, I would hope you know that Advent season is not just a season of waiting for a distant King’s return, but for the friend our hearts have longed for. A friend who waits with us and for us. And on this Christmas day, that wait is promised not to end in despair. He has come. He will come. And like any good story, the more grueling the wait, the far grander the ending will surely be. I have been long awaiting this new book from Wesley Hill. Hill is a pioneer when it comes to the murky waters of affirming celibacy and a traditional sexual ethic within the church. But this does not mean Hill is asking for those (“celibate, gay christians”) to pursue a life without intimacy, certainly not. This is where Hill challenges us to a rekindle a better understanding of friendship in a more holistic manner. 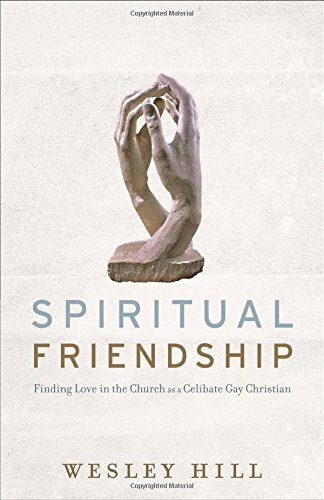 In “Spiritual Friendship”, Wesley Hill poignantly crafts his own experiences into a rich telling and exposition on the long, lost tradition of committed, spiritual friendships. Hill expertly takes a look at the world & culture we live in and shows how friendship has in several ways become a foreign language to us. Without becoming unrealistic or overly sentimental, Hill also begins to express both personally and theologically what a transformed view of friendship might look to us practically. Hill then leaves us readers with practical steps to take towards cultivating friendship itself, not leaving us on a pessimistic note. The life of a celibate christian does not have to end (or worse endure) in loneliness as Hill reminds us, and I’m thankful to be practically reminded of that. Overall, this is a book that the church needs to consider. Not just for the sake of ____ in our churches, but for the church herself. And for that, I’m grateful. I have, and I do. For the better part of my sophmore year of college, I spent my time cramped up in my bedroom and frustrated by a lack of meaningful connection. During that time, I had to seriously wrestle with a stark and nagging loneliness that had been creeping around and was just beginning to show its terrifying face. I remember one-time sitting in a meeting with some others from my campus ministry’s leadership team, and we had begun to go around and share our high points and low points for the week. It was my turn, and I recall needing to confess that I had felt deeply alone. It was mortifying and not because of how people responded (which was actually incredibly well). I felt shame bubbling up in me to even release the words, “I feel really alone.” I don’t feel like I did it out of a desire for a pity party or just because I wanted the attention. I just feel like I had to. It had built up, and it felt as if without reprieve I’d surely just sink deeper and deeper into the mire. When people profess that they are lonely, we often pity them. Don’t we? There’s this underlying assumption that I often think about that goes sort of like this, “that poor soul must have no friends. Maybe they should join a church or a crossfit. Maybe they should get married. Maybe they should branch out a little more,” or something along those lines. Yet I still feel myself thinking those thoughts without often recognizing how much I feel their words myself. We’re all on an even playing field. Happily married, mournfully married, unwillingly single, happily single, divorced, it doesn’t matter. Our estate is a lonely one. At this point, you’re probably confused, maybe a little pissed off that I would make such a remark about you. You have your brunch friends and your date nights. You don’t wake up in a bed alone. You have at least a thousand Facebook friends, but yes, you’re still alone. But hear me out, I only say that we are all alone, so that we might begin to recognize something beautiful. I want to argue that although we all feel alone that that feeling of loneliness is actually a God-given, God-reflecting, and good desire. Ultimately, I believe there’s a point to the loneliness, and that despite the most intimate of relationships we still feel different degrees of loneliness but still feel lonely nonetheless. The most poignant definition of loneliness I’ve ever come across is simply this: “the want of [or longing for] intimacy“. It’s the state Adam was in in perfect vertical relationship with God, but still lacking closeness, horizontally, with another person even before there was the entrance of sin into the world. If loneliness is as previously defined, then can any of us truly claim to be in perfect intimacy with another? Do we ever cease longing for more closeness with another person? There always a want for more closeness, for a friendship to be cultivated, for another to know us just a little bit more – this is to feel a little bit of loneliness. The problem is not that we feel lonely. The problem is how we have adapted to respond to those feelings of loneliness. When we feel lonely, running from it may be just prolonging the inevitable. If we’re afraid to feel lonely, we may be doomed to it. To a certain degree, it may mean that a good place to start is becoming a tiny bit more conscious of our desire for community, intimacy, and friendship rather than consistently running to an outlet to keep our minds away from those fears. Imagine a broken world like this without this desire for intimacy, or to put it more simply, imagine a world where no one ever felt lonely. I’d imagine everyone would be content to themselves. There would be no community, no coffee dates, no netflix-binging with roommates, no marriage, no family unit, no friendship, no vulnerable conversations, no long walks together, and no Trinity. An unredeemed* world without the feelings of loneliness would be a world of ironic isolation. Feelings of loneliness are similar to feelings of physical pain. We need something like those feelings of pain to indicate to us that we are in an unhealthy or harmful place and need to move to something better – a place of isolation to a place of friendship. The pain itself is not bad. What causes it may be, but the pain is actually helpful if only we can find a way to respond to it properly. Numbing a dislocated shoulder won’t fix it but a painful relocation will. Like Kierkegaard said, “the cure is precisely to understand oneself in one’s longing for community,” but the cure often feels like it’s killing us. To feel your loneliness is painful. There’s no denying that. We were created for intimacy with God and others. Vertically and horizontally, and it’s no surprise that after that intimacy was shattered with the Fall of man that Adam & Eve hid themselves from God and hid their nakedness from one another with their fig-leaf loincloths. We’re all terrified of exposing ourselves, and we’re all terrified of a life of isolation. In exposing ourselves, we risk rejection, we risk shame, and we risk our own comfort. In isolation, we lack the sort of companionship that encourages us to take risks, to journey, and to ultimately live. But thankfully the story doesn’t end in isolation. Thankfully we have a God who knows our loneliness and won’t leave us in it. Thankfully there’s a redeemer who redeems by uniting all things in himself, in perfect intimacy. One who has known loneliness far better than we ever have and is with us in it. He who became lonely for the lonely came to draw us into His embrace. From intimacy to isolation, He came to rescue us from our lonely position. * I say “unredeemed world” because I believe in the new heavens and new earth we will be living in perfect relation to God and one another – perfect intimacy and thus no desire for something we have already attained.